KooZic will soon be blowing its first candle as we are progressively reaching a satisfying result in terms of functionalities, stability and performances. In the meantime, the v0.7.0 is bringing some nice new views, amongst bug fixes and performance improvements. KooZic retrieves artist information from LastFM since v0.2.0. 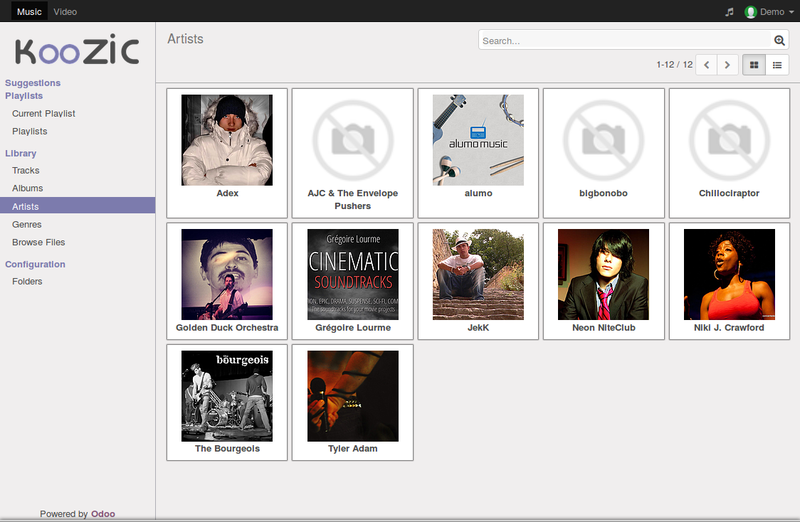 We retrieve the biography, top songs, similar artists… but not the images. It is the case as of v0.7.0, with an extra artist thumbnails view. It makes browsing more pleasant ;-) Moreover, the artist image is used in the music panel if the album cover cannot be found. Until today, playing a track would always require to go through a playlist. You couldn’t simply ‘play’ a song, you had to add it to a playlist, then play it. It was a design choice made for the sake of coding simplicity, but that wasn’t user friendly. From v0.7.0, it is possible to start playing a song from anywhere (artist view, album view…). Just press the ‘Play’ button. At the end of the song, the player will switch back to the current playlist. 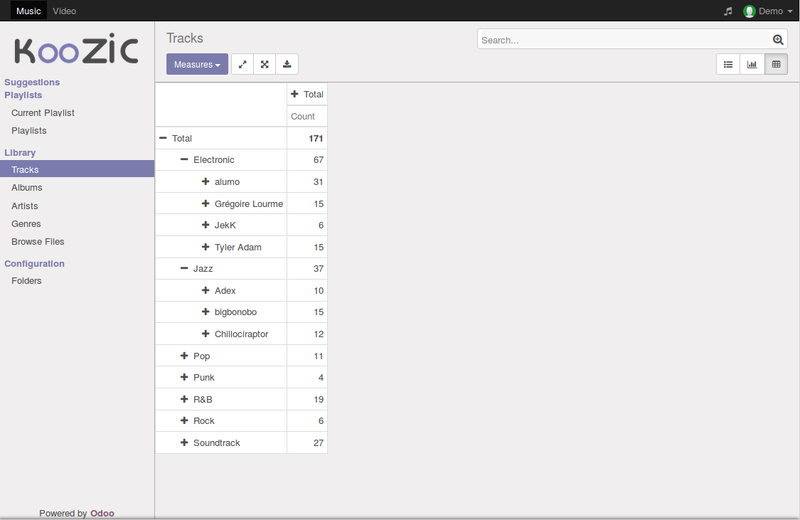 You always wanted to get some statistical insights to your music library? For example, what are the most common music genres? The v0.7.0 brings that feature! 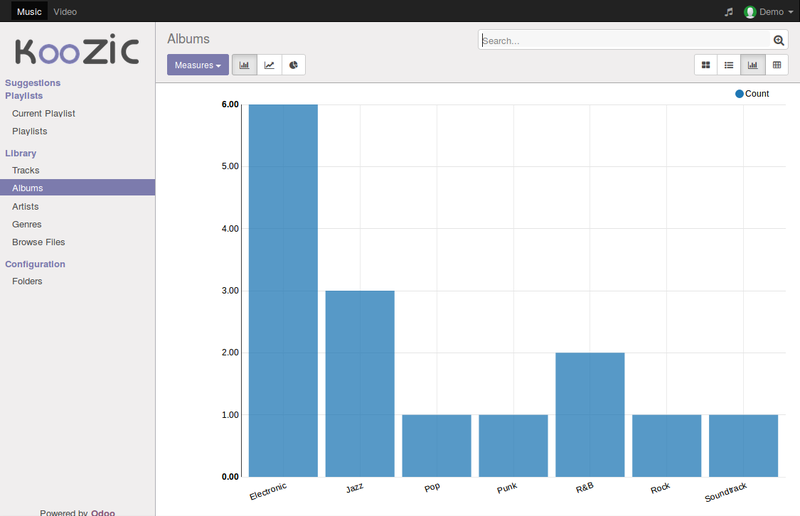 Thanks to the out-of-the-box Odoo tools, a graph and a pivot view are available. The views are available for albums, but also for tracks. The latest view (‘pivot’) is great to spot duplicated content (“Pop/Rock” and “Pop-Rock”, for example), as well as getting detailed information.